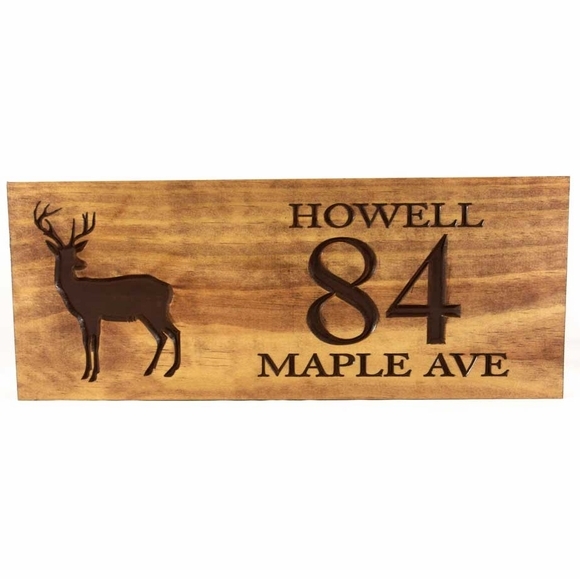 Carved Wood Address Plaque with Deer Silhouette - - personalized wooden carved address sign. Solid pine cabin sign loaded with rustic charm. Wall mount. Made in USA. Three line cabin sign customized with the name, house number, and street name you specify and edge style you select. Solid pine construction. Carved personalization and deer silhouette. Rustic finish. Three sizes: 18"W x 7"H x 3/8"; 22"W x 9"H x 3/8"; 24"W x 11"H x 3/8". Name line holds up to fourteen (14) 1" letters. House number line holds up to five (5) 3.5" numbers. Street name line holds up to fourteen (14) 1" characters. Name line holds up to seventeen (17) 1" letters. Street name line holds up to seventeen (17) 1" letters. Name line holds up to seventeen (17) 1.5" letters. House number line holds up to five (5) 3" numbers. Street name line holds up to seventeen (17) 1.5" letters. Please make sure to order the correct sign size for your name and street name. (NOTE: you do not have to fill the entire input box.) Leave the six unused input boxes empty. Four edge styles: standard (as shown in sample), roman OGEE edge, round over edge, or chamfer edge. Finish: rustic brown Brown text and deer. Sealed with a clear-coat marine finish. Rustic brown with clear-coat marine-grade sealer. Text and carved portions are painted medium brown. The overall wood grain is captured and highlighted with a variety of brown tones to create an overall rustic look. Each sign is unique, as the highlighted wood grain is different with each piece of wood. Custom made. Please allow 2 to 3 weeks for delivery. NOTE: Wood is a natural material and therefore has inconsistent color tones and grain patterns. Your finished sign may look slightly different from the sample.